Posted on September 14, 2012 by Susan H.
Bruschetta Pasta is one of our family summer favourites! So simple to put together…it has become one of my top travel side dishes! Cherry Tomato plants are awesome! If you are going to plant a tomato plant next year, I highly recommend choosing one of the many varieties of cherry tomatoes. My personal favourite is the Chocolate Cherry…it actually grows a purpley brown colour…the taste is ‘out of this world’! Eating cherry tomatoes, in my mind, is like eating candy! Bruschetta Pasta always tastes better the next day. Of course, in our family, it barely survives. Once prepared, everyone, including myself, wants to eat it! In order to maximize the marinating, I always make the tomato bruschetta mixture in the morning to let all the flavours meld together before I add the pasta…about 1/2 hour before we sit down. This week, I was in a panic thinking of a side for dinner. 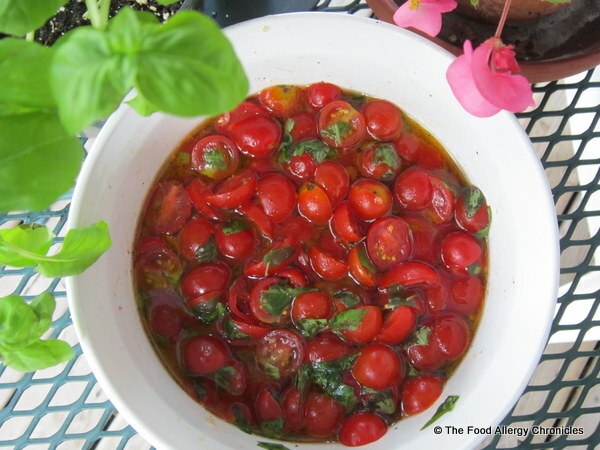 I noticed a few leftover garden tomatoes on the counter…within a couple minutes I had the tomatoes cubed, garlic minced, salt and pepper grinded, extra virgin olive oil drizzled in and fresh basil from the garden quickly torn apart and tossed in. Done! With only a couple of hours to sit…it still tasted divine! Bruschetta Pasta can also be considered a meal unto its own. With the addition of some canned tuna, a drizzle of extra virgin olive oil, a sprinkle of hot pepper flakes and a side of roasted broccoli and cauliflower…it was my dinner the other night. Canned beans would be another nice option. Cover and let rest on the counter for the day. Drain pasta. Do not rinse pasta! Immediately toss pasta with bruschetta mixture. Let rest for at least a 1/2 an hour to let the pasta absorb all the mouth-watering flavours of the tomato bruschetta mixture. 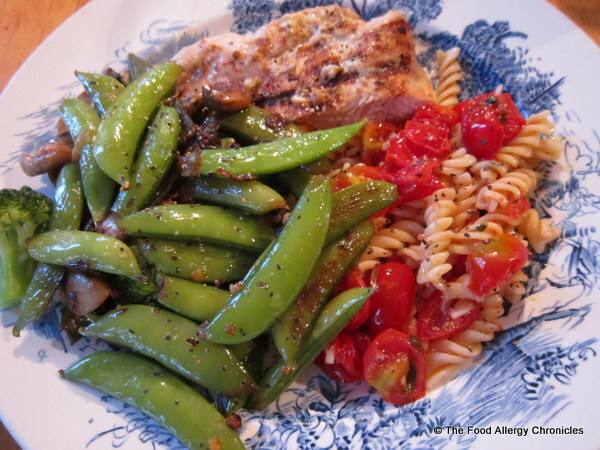 One of the meals my family enjoyed at the rented cottage… Bruschetta Pasta with Barbecued Lemon Chicken and sugar snap peas sautéed with mushrooms, onions, garlic and hot pepper flakes. Yummy! 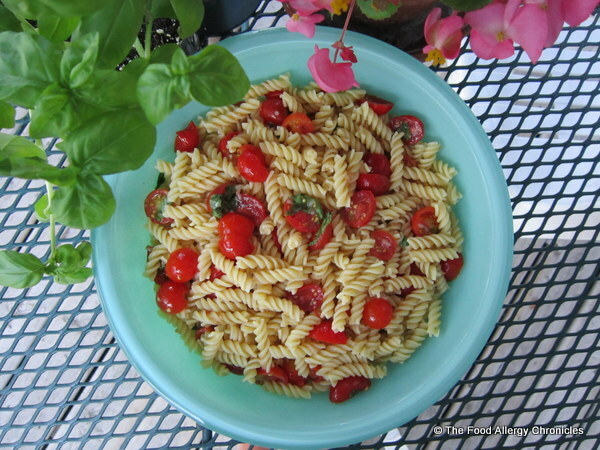 This entry was posted in dinner, multiple food allergies, salads, side dish, vegetables and tagged Bruschetta Pasta, cherry tomatoes, pasta salad, Smart Catelli Fussili Pasta by Susan H.. Bookmark the permalink. Such a great website! I have a food allergy, too-and it is so great to read about others that are dealing with this issue and finding out more great recipes AND more great resources…thanks for posting! Thank you for stopping by! 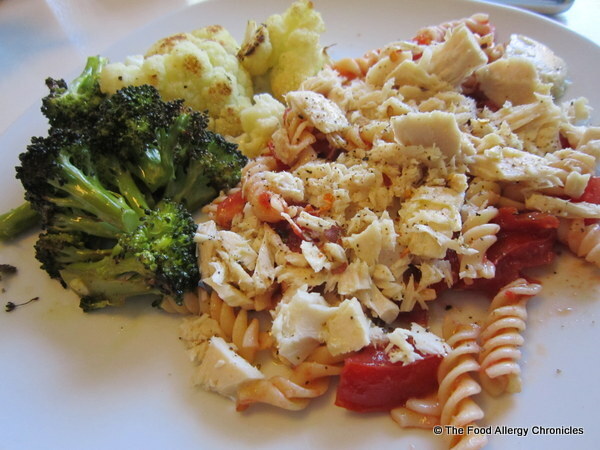 I hope you enjoy my adapted recipes…what food allergy do you have?